I’ve said it before and I’ll say it again – for me to like a salad means it is going to have to be hearty and filling. That doesn’t mean it needs to be loaded down in meats, cheeses, and croutons (though an occasional antipasto salad is yummy!). Enter this blackberry salad. This recipe was borne of items that happened to be in my refrigerator & garden, but it immediately became a favorite of mine. It works because it has a sweet and sour component from the berries and vinegar, a creamy component from the goat cheese, a crunch from the pecans, and the slight warmth I get from warming the oil, sauteing the shallots, and warming the blackberries. The result is a satisfying, luxurious-tasting meal that also ensures I get my greens and antioxidants for the day. Wash and dry the greens, and place them in a large salad bowl. Toast the pecans in a dry pan over medium heat and reserve. Heat the oil over medium heat and add the shallot, sauteing until the shallot has softened. Add the blackberries and let warm, about 30 seconds before adding the balsamic vinegar, taking care not to inhale the fumes that will come off the vinegar as it hits the heat. Season with salt and pepper. Whisk together the olive oil and vinegar, adding more olive oil if needed to the mixture to make a vinaigrette. 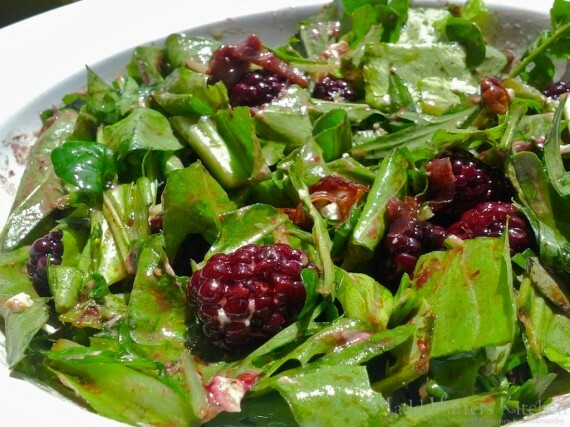 Top the greens with the warm vinaigrette mixture, blackberries, and shallots. Top the salad with the goat cheese and pecans, and season with salt and pepper once more if needed. Note: You should make sure to add the goat cheese after you’ve added the dressing for presentation’s sake. If you add it beforehand, when you toss the salad together, it will turn the most unbecoming pink color due to the blackberry and balsamic vinegar melting together with the goat cheese. Still tastes amazing, but the look – not so much.